(CNN) Ami Vitale has got President Obama beat. But this was not Vitale’s first passion. She was originally a conflict photographer covering violent war zones around the world. An environmental charity called The Nature Conservancy offered her the chance to “see all the beauty and the magic that exists everywhere,” as she describes it. Vitale abandoned her six-month break and seized the opportunity. What followed included a lengthy series called “Kenya’s Last Rhinos” about rangers caring for the handful of remaining white rhinos in the world. Unfortunately, despite the efforts of rangers and Vitale’s documentation of their efforts, she says the white rhino is “functionally extinct.” However, on the other side of the world, Vitale has been able to share a success story: it was recently announced that the giant panda is no longer an endangered species. 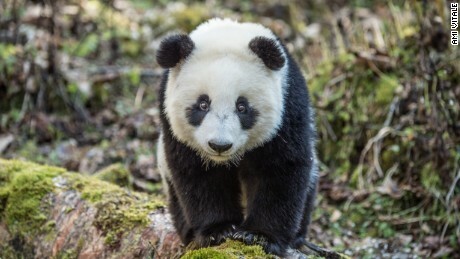 “Pandas Gone Wild” depicts what Vitale calls “a minor miracle”: a program at the Wolong National Nature Reserve releasing captive born pandas back into the wild. “It turns out that after one generation in captivity, pandas forget how to live in the wild, and you have to train them,” she explains. Embedded with the program, Vitale had to work incognito, wearing a panda suit laced with their scent, so as not to unsettle the bears. Vitale finds plenty of common ground between the animals and their human carers. “I think all of us, every creature, is a big mystery,” the photographer says. She suggests the key is to give the subject enough time to reveal themselves. Vitale should know, having been an “incredibly shy, introverted and gawky” child before picking up a camera.